Creating a portrait means making a series of choices. With each step of the process we move closer to what suits you best. At all times please feel free to take the most important step of all and contact me. I am always happy to answer questions and clarify doubts. Is it to be a child portrait or an adult portrait? A single, double or group portrait? A family portrait or an individual portrait? is to look at the Portrait Gallery of this website. Pay attention to the different styles and mediums and think about which most appeal to you. is to decide the portrait size you would like. Two scales are typically used, a real size portrait (large size) or half size portrait (small size). is to choose the length. Would you prefer a head and shoulder portrait, or a ¾ length portrait (head to knees)? On special request I can also do a full length portrait (real size head to toes). I frequently work in charcoal, terracotta and a combination of the two, but what I mostly use are pastels on a special kind of paper. These mediums have some significant advantages over painting in oils. Using them, I can express the sitter’s essence more directly, more immediately, more quickly and more accurately. As I travel to my clients’ homes, often abroad, this medium is also more practical. Working with oils needs to be done in a studio to avoid the messy stains of the paint and the penetrating smells of turpentine. is to make your choice. Do you prefer Terracotta Portraits, Terracotta and Charcoal or Pastels? Would you like a Plain Background or a Decorative one? 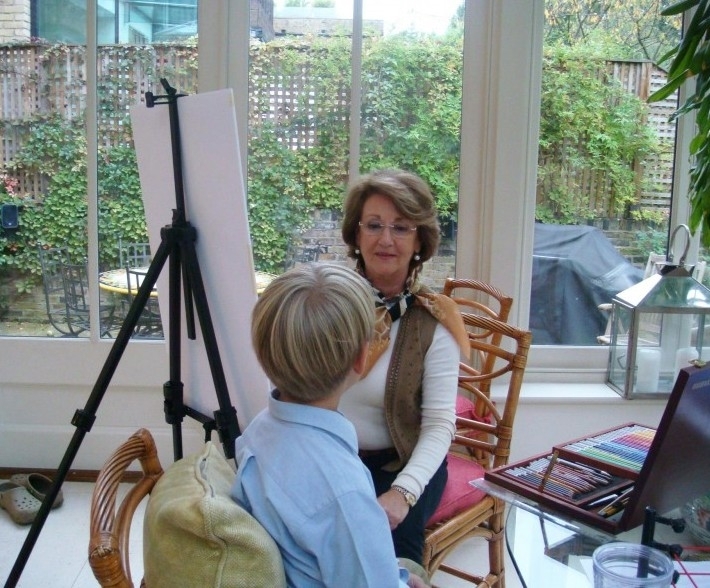 I travel worldwide to do portraits in the comfortable surroundings of my clients’ own homes. In my experience, people are much more relaxed in their own environment which results in a more natural and expressive portrait. As well as my native Spanish and German, I speak fluent English, French and some Italian. This along with my travel and portraiture experience allows me to adapt to many environments with ease. In truth, this is often a wonderful experience for both of us – many of my past clients are now great friends. I currently live in Vienna, Austria but I continue to create portraits across Europe, in the UK and in the USA. The final step is to contact me to discuss how to proceed. Sitting for a portrait should be a pleasure not a chore. The more the subject can relax and free themselves of anxiety and expectations, the better the resulting portrait will be. The process of sitting is like a shared meditation and can be a very positive experience. My finest portraits usually come from following a procedure. First, we have a photographic session. I take pictures of the subject(s) in various poses. Different clothing can be tried at this point. Your creativity is welcome as we work to identify the look of the portrait. Once the pictures are developed, I meet with everyone who wishes to decide the elements of the portrait, the pose and the clothing. We view the pictures and make decisions. The subject participates in all art sessions or I do some work unattended and the subject participates in some critical sessions. For my most time-pressured clients and for subjects who are unavailable for sittings I will occasionally work completely from photographs. There are some limitations to this option, which I will discuss directly with you. Please don’t have your hair cut just before the portrait sitting! Fresh haircuts rarely work well for the drawing. Plan to have your hair on the long side and just trim it a few weeks before the sittings. Consider postponing crew cuts until after the portrait sittings are finished. It is my pleasure to create great portraits. As families are the cornerstones of our society, it is especially gratifying to capture families at their best. And that is often the goal: to capture people as they ideally wish to remember themselves. That these portraits are treasured for many years and generations is testament to their value. May these vibrant, classic portraits be the heirlooms for the next generation. I look forward to creating a treasure for you and your family.